When are people are more or less likely to get stuck in their current experience? One important factor seems to be how information in the current environment is framed, or described. 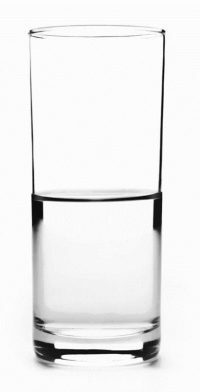 We know, intuitively, that there are different ways of thinking about things: The same glass can be seen as half full or half empty. 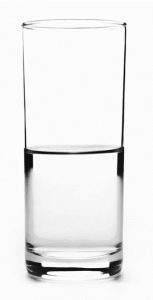 Meanwhile, there is quite a bit of research in the behavioral sciences showing that depending on how you describe the glass, people will feel differently about it: They like it when it’s described as half full, and dislike it when it’s described as half empty. But what happens when the description changes? Can people switch back and forth from one conceptualization to another, or do they get stuck in one way of thinking about it? Integrating the literatures on functional fixedness, framing, and negativity biases, we hypothesized that negative frames might be fundamentally “stickier” than positive frames, so that it is more difficult for people to shift from conceptualizing an issue in terms of negatives to reconceptualizing it in terms of positives (compared to shifting from positives to negatives). In an NSF-funded project, we borrowed classic paradigms in framing research (such as Tversky and Kahneman’s “Asian flu” scenario) and added a twist: After participants saw information framed in terms of either negatives (e.g., lives lost) or positives (e.g., lives saved), they saw the same information reframed in the opposite way. Consistent with the notion that negative frames are conceptually stickier than positive frames, negative-to-positive reframing had a muted impact on participants’ risk preferences and evaluations, compared to positive-to-negative reframing. In other experiments, participants took longer to solve a simple math problem that required reconceptualizing negatives as positives, compared to when the same math problem involved mentally converting from positives to negatives. 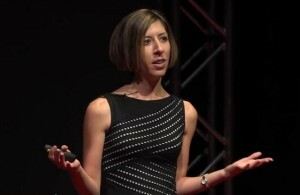 Taken together, the results of our studies expand the field’s current understanding of framing effects to suggest that frames can have lingering influences outside of the context in which they are first encountered, and that it is more difficult to convert mentally from negative-based conceptualizations to positive-based conceptualizations than vice versa. These results also have interesting implications for understanding the dynamic effects of framing on political attitudes, medical decision-making, and economic recovery following a recession. Recent research in our lab builds on these initial studies to develop a comprehensive and functional account of negativity and positivity biases. Boydstun, A. E., Ledgerwood, A., & Sparks, J. (in press). A negativity bias in reframing shapes political preferences even in partisan contexts. Social and Personality Psychology Science. Sparks, J., & Ledgerwood, A. (2017). When good is stickier than bad: Understanding gain/loss asymmetries in sequential framing effects. Journal of Experimental Psychology: General, 146, 1086-1105. Ledgerwood, A., & Boydstun, A. E. (2014). Sticky prospects: Loss frames are cognitively stickier than gain frames. Journal of Experimental Psychology: General, 143, 376-385.